Jim Pike, a third-grade teacher at Ascension Catholic School in Los Angeles, was not a big video game fan. But he found out about Minecraft at a job interview and later decided to introduce it in his classroom mid-year to teach math. After four months of use, the results were impressive. Math test scores doubled, from 42 percent average correct in January to 84 percent average correct in May, in the Common Core categories of Measurement & Data, Number & Operation-Fractions, and Operations & Algebraic Thinking. This article describes one of Jim’s Minecraft lessons which teaches target area and perimeter, the relationship between multiplication and division, and multi-step problems. = 5, and H (height) = 7. One of several slides from Jim’s edWeb.net presentation. perimeter; ‘C’ is the number of blocks for all the columns; ‘TB’ is all the blocks in the structure (without stairs); ‘S’ is the number of blocks for the stairs; and ‘M’ is the total number of Minecraft blocks needed to build the Parthenon. Jim gave the lesson as whole-class instruction, opening a single-player superflat world on his computer and showing it on the overhead projector, then building the Parthenon described in the equations. (Jim noted that starting with whole class instruction, rather than letting students build the Parthenon themselves, was important to keep the class on track.) 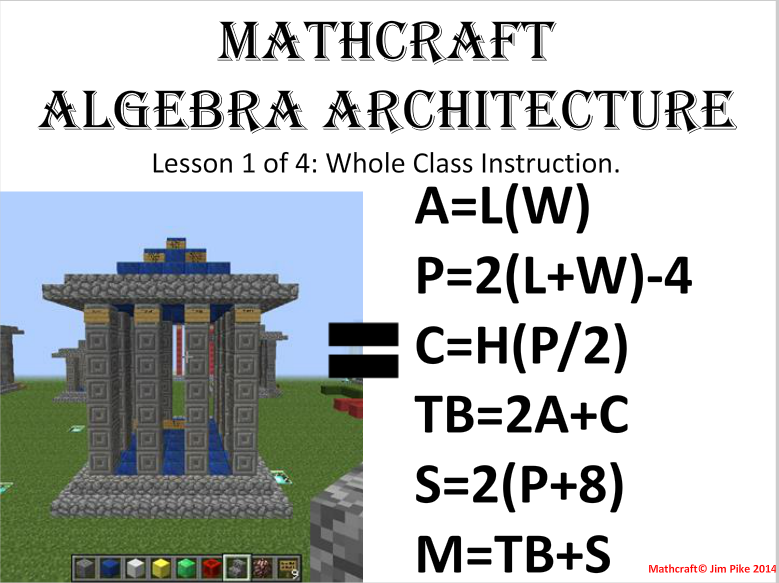 He gave the students the algebraic formulas, and as a class had them reason out the associated number of Minecraft blocks. Jim provided many such exercises in the days following, and many kids came to call this type of problem an “algebra puzzle” as if it was a game in itself. 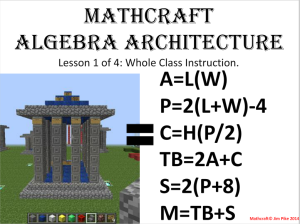 Once the class agreed on the answers to the equations, each student was given a limited set of blocks in Minecraft and each built their own Parthenon, accompanied by a Minecraft sign in which they listed the equations worked out. For fun, after the Parthenons were built, they were marked with “boy” and “girl” flags and the kids were allowed to knock them down. Jim said that allowing this play was important for kids’ enjoyment of the class. He also noted that the Parthenon could be linked to study of Greek myths or ancient Greece. Jim likes manipulatives and found that the virtual aspect of Minecraft is an advantage, since kids can’t steal each other’s blocks or throw the materials around the classroom. Jim noticed a marked change in the attitude of the students once he started using Minecraft. They became more excited about learning. They got excited about math and became good at it, which translated in expecting to be able to do well in other areas such as literacy. Jim bought a personal license for himself, and the school bought site licenses for the school computer lab from Minecraftedu.com, which cost a total of $350 for 25 computers. This included a dedicated Minecraft server for the classroom. With a site license there is no need to remember passwords. A free trial of Minecraft is available. See “Getting Started in Minecraft” for details. Watch every student’s screen using a classroom management tool such as LanSchool or Vision, to make sure students keep on track and don’t go invisible in the game. and make him or her responsible for deleting them. sure students don’t knock each other’s structures down. The settings on the Minecraftedu.com server are helpful. people’s goods) by suggesting that they hide their goodies well. But students won’t be able to steal each other’s blocks. Jim Pike teaches at St. Martin of Tours School in Los Angeles (Brentwood), and designs curriculum for Code Revolution (coderevkids.com). He is creating new curriculum for Minecraft’s use in class and will soon offer online professional development. He enjoys collaborating with other teachers and can be reached at joakley@hotmail.com. Tagged Common Core, Jim Pike, math, Minecraft. Bookmark the permalink. I teach math to middle school special education students, and I was an engineer for a long long time too. I am looking at the feasibility of displaying a math pdf worksheet, at various points inside minecraft, and have the students answer questions as they progress through some minecraft story. all within the game. is there something like this out there in the web. I am new to minecraft and don’t know what all is possible, but if some java code needs to be written I would be up to it.